For the week I was alone, I struggled with my conscience, having spent this obscene amount on perfume and tried my best to blame it on my impulsive nature, which is true after all…still, it doesn’t justify an excuse. So, being born both impulsive and ingenious, I arrived at a solution to the problem. The problem of my guilt that is. On Hartman’s arrival back in Paris, we had this glorious magical summer’s day. I sent him a message telling him to be home at 18:00. We have a date. He was not to be late. Now, send a man a message like that and see what happens…? Oh, you want to know about the date? Well, imagine this…I have a basket at the ready, filled with his favorite goodies like peaches wrapped in prosciutto, scallops with orange and a saffron mayonnaise, a cold champagne, a baguette to dip into rich seductive olive oil and fleur de sel…I have ordered and received my golden exuberant sunshine. 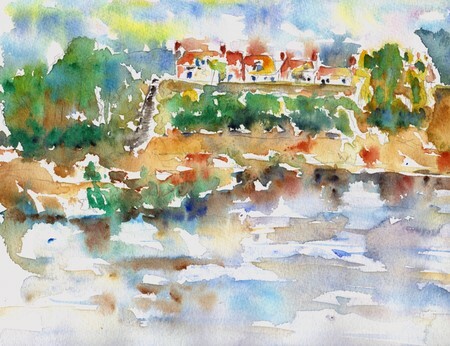 The river Loire is 2 minutes walking from our front door, the water rushing by, heightening the sensation of summer madness, sun, and bare skin…..and me, enveloped in Coco Chanel. RONNELL!! WHAT A PERFECTLY FANTASTICALLY DESIGNED DAY – SPIRIT – SKETCHES — THE WORKS! Your writing has me mesmerized, dreamy, liquid with ideas, inspiration, visions!! BRAVA, mia cara!! BRAVA! for the soul behind all of this .. and so much more!! More fabuous paintings. You are such an inspiration to us all. How did we ever survive during your absence!You REALLY made a perfect day for us also by sharing the wonder of it all! Thanks. 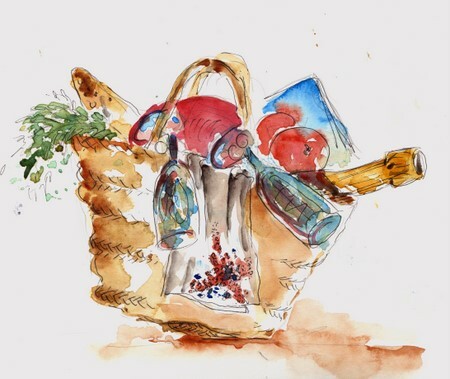 Oh Ronell, You are BACK BABY – Lordy I feel like I have had a mini vacation (shopping and all) through your account and the lovely watercolors, sing with life!! Simply Glorious! Your Chanel was a gift for Hubby!! “be”. Enjoy that expensive perfume and the rest of summer! 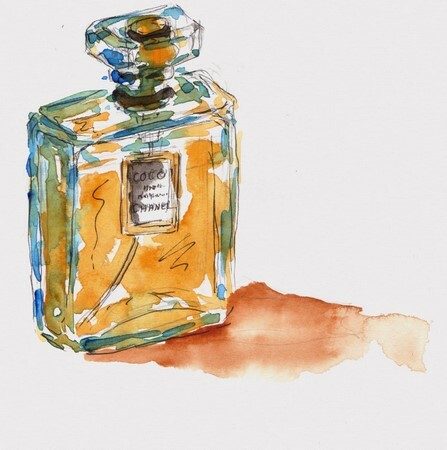 Wonderful story, wonderful paintings… I LOVE the Chanel bottle! Gosh, I love visiting your blog!!! Not only is your artwork stunning, your self disclosure is just too real! One would be inclined to say, “shame on you!” but you are just too brilliant and funny!!! Wow, what glorious, sensual paintings and writing! I like all the pics but especially the last picture with the softly oozly watercolors. Gorgeous! When my (now ex-) husband went away I always ended up buying kitchen appliances. Maybe that’s why we’re divorced and you’re still married–you buy perfume and make aphrodesiacal foods and I buy a new blender? Decadent! You are like a good novel with pictures! I’m wearing my Coco Chanel tomorrow in your honor! Thank you for all the enthusiastic comments….it is good to be back!I missed it all – everybody’s work, the comments, the humor…I’ve come to recognize everyone by his/her own style of commenting…that’s so great! Deborah: I would love to meet…let me know your dates and Casey and me can meet you in Paris and spend some time, or if you want to see our area, you are of course more than welcome! Ronell – wow – once the dam is broken it all comes flooding out! It looks like you’ve been storing up all this poetry and color for a few weeks – these just shimmer with light. It looks like the good weather is here now – let’s hope it holds! I LOVE this post. The words and pictures. Brilliant. Your story was wonderful. And boy, these drawings tell me your on a roll again (no pressure though!). My faves? Wel I just can’t decide…maybe the perfume…maybe the basket (such great composition on that one BTW…nope I love them all! GREAT work Ronell. Oh, how charming!! I love the story and the paintings and I love perfume, too! Maybe we can check out a perfume boutique or two in Paris–if not in September, then in November! So glad you’re feelig better. Oh Ronell – it’s SO great to have you back. I’ve missed your loose carefree paintings, filled with color and life. And your words. Your sometimes wry, sometimes funny, always honest words. Wowee…great post! Here’s to self-idulgence. I’m glad you bought the perfume…I’m sure it made your evening that much more magical. What brilliant, gorgeous form you are in Ronell. The paintings are wonderful – perfect illustrations of your delightful confessions. I’m wondering if I walk through a cloud of Coco, I too could come out the other side of this summer slump – not to mention giving HWEM shock of his life 😉 Brava! Ooh, it’s good to see you painting again! What a wonderful way to assuage your guilt. Sounds idyllic! All of this from a perfume purchase?! Maybe it would help if I started sniffing from the pretty bottles on my dresser. *lol*Love your artwork and your guilt-ridden tale. All wonderful. altWhat a wonderful way to welcome your husband home. I plan on trying your fun and romantic ideas. Now, I have never tried Coco Chanel but i am going to check it out too. 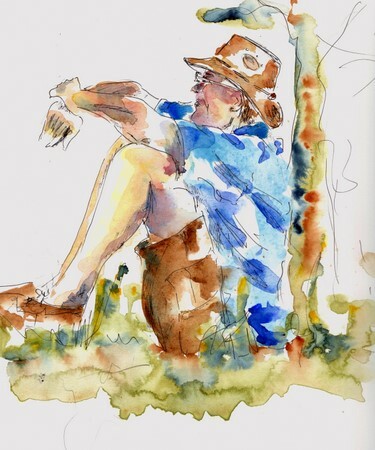 The Loire, the Channel, your husband, your humour and your watercolours – gorgeous! Lovely sketches Ronell! I’d say you were unstuck! Oh my, you are creative in just about everything, aren’t you? lol! I’m sure it made your husband happy! I just love your paintings, so loose and colorful. And don’t feel guilty about Chanel. There is something about real perfume… I think it’s that musky fragrance… sooooo much better than cologne. Indulge and be happy!